Preheat oven to 375°F (190°C). Make 6 slits through centre along length of each tenderloin, without cutting all the way through. Insert 1 slice of apple and 1 slice of sage into each slit. Push soaked wooden skewers through length of tenderloin to hold together. Heat apple juice, butter, mustard, maple syrup, thyme, salt and pepper in saucepan set over medium-high heat. Bring to boil; boil for 15 to 20 minutes or until reduced by about half and syrupy. Heat half of the oil in large heatproof skillet set over medium-high heat. Cook pork tenderloin on all sides for 3 to 4 minutes or until browned. Transfer to foil-lined baking sheet. Roast in oven, basting with half of the apple glaze for 25 to 30 minutes or until internal temperature reaches 150°F (65°C). Toss asparagus with remaining oil. Transfer to baking sheet; roast for 10 minutes. 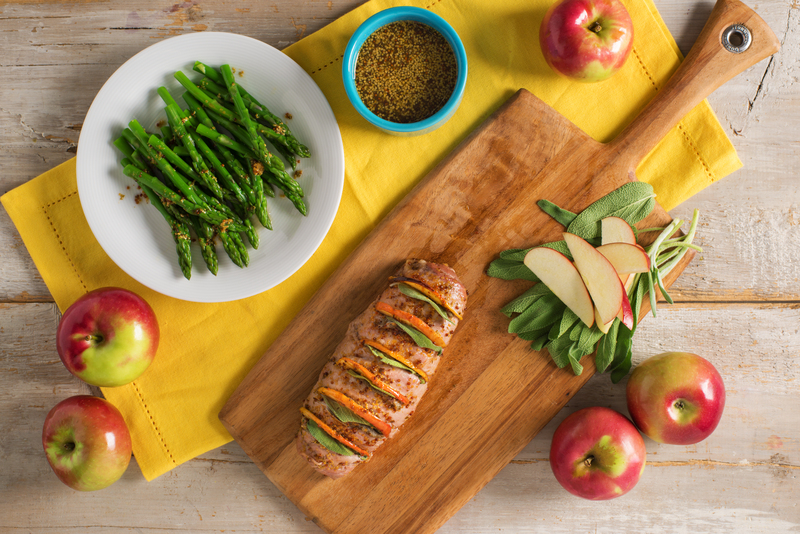 Drizzle pork and asparagus with remaining apple glaze before serving. To prevent browning, store apples in acidulated water (water with fresh lemon juice) in refrigerator up to 12 hours ahead.